A perennial favourite, particularly in the west where the film has gathered a cult following despite representing Chang Cheh‘s increasingly hokey, blood-drenched and downright bizarre 1980s output and the tail-end of Shaw Brothers’ kung fu movie dominance. Chang Cheh uses two of his Venoms cast – Lo Meng and latter-day Venom Ricky Cheng (the others were in Taiwan shooting another ninja film, Phillip Kwok’s Ninja in the Deadly Trap) – to lead his own studio-based slasher. The sets, coupled with the outlandish weapons and costumes, add to the overall artifice and cheapen the look of the film, whereas the script is almost non-existent. The film is a carnage-ridden death fest and features nothing like the rounded characters or intriguing story of Cheh’s earlier work. But that’s not to say it’s not enjoyable. The film excels in creating remarkably inventive ideas through Ricky Cheng’s choreography, which is almost pedantic in adhering closely to historic Japanese weaponry and form, with the names of individual weapons flashing up on screen – in a similar fashion to Lau Kar-leung‘s Legendary Weapons of China, released the same year – even if the film reevaluates these traditions for its Chinese audience. During a rival schools face-off between the angelic, white-robed Yen clan and the dastardly Kang school, a Japanese Samurai is defeated and performs seppuku. In the throes of death, he issues a challenge to the Yen clan from a legendary ninja master (Michael Chan) who plans of vengeful attack using his Five Element Ninjas, who are each masters of subterfuge in strange manifestations of wood, earth, fire, gold and water. The wood elements disguise themselves as trees, and ninja are propelled from the earth and glide on giant paddling water spiders – all of which is just as awesome as it sounds. 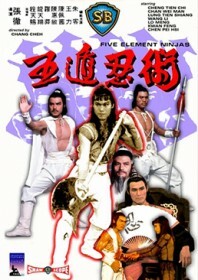 The school is braced for the attack but the ninja are too strong and the students are slaughtered, apart from Ricky Cheng, who escapes and quickly engages in an underdeveloped subplot involving a Chinese ninja master and three other random pupils. Once the quartet have the elements sussed, they embark on their bloody quest for revenge. In a display of typical Chang Cheh chauvinism, the only female in the film is an undercover ninja in a skimpy fishnet dress who acts as a seductive and manipulative thorn in the sides of the film’s heroic male protagonists. It’s the type of film where one of the fighters trips on his own entrails after being sliced through the guts. So you have been warned.